For severe narcists like me, there is a remedy that is needed periodically at all costs. The remedy is periodic blows of cold water on the back of one's head, which extinct the simmering fire of arrogance for a while and turn it into a tamed lamb. The blow is more effective when it comes from a person never expected. Thankfully enough, there was a person who gave me such a huge blow on the back of my head and cured my narcissism very effectively. I felt thankful and sorry for the person that I decided to blog here after a year's silence. 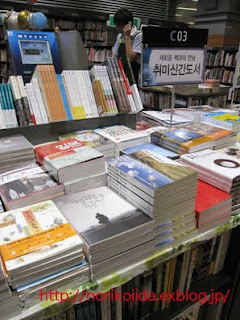 Yesterday, I went to a large bookstore in Kangnam to spend time. I was heading to the corner that I used to visit, but something attracting my female instinct came into my eyes. It was a photo of a man's appearance from the back. It was in the front page of the "Yon-sama Book" that all the TVs and internet media had been reporting loudly the day before. I was not his anti, but I was not quite fond of him, either. The fact that I was attracted by his photo for a moment annoyed me. I was about to walk away, but the fact that a thumb-sized back of Yonsama could attract me with such a strong force annoyed me again. "OK," I said to myself, "it's just a book of an 'ordinary entertainer', right?" I gave a snort, picked the book up, stood in an arrogant posture, and started to skim through the pages with one hand - like skimming a women's magazine. At that moment, a middle-aged woman suddenly appeared from nowhere, and gazed shyly at a 'Yonsama book' - which was laid next to my arrogant hand - for a while. After a while, she carefully picked that 'Yonsama book' with both hands in even shyer manner, held it in her arms, and quietly walked away. It might be the strange aftereffect of the 'shy lady' that made me feel ashamed of my arrogant posture. Unwillingly, I held that 'Yonsama book' properly with both hands - in the way that I handle a 'book' - and started to have a look again from the first page. There were Forewords of VIPs as if to match the name value of Yonsama. Then followed the Table of Contents (stay - leave - clear away - contemplate - return - leave again), which was not expected for an ordinary entertainer's book. As I felt annoyed for the third time with the 'contents', I skipped the preface of the writer, that I would never skip in other books. I was going to skim through the pages, but I had to stop after a couple of pages. A photo that gave me very similar impression with the 'shy lady' stopped my eyes. It was a black-and white photograph of three pairs of black rubber shoes neatly laid on a terracing stone. On the next page, there were two short lines. "The table of mother, the tears of mother"
I used to scoff at the movie 'Titanic', and threw a cynical smile at Winter Sonata (even though my sister was shedding tears sitting by me). However, I felt like falling on my knees at this single photo, shouting "yes, sir!" I didn't want to admit this embarrassing and unexpected situation, and carefully looked at the photo once more. To me, who had some knowledge on photography, BYJ's photo was not technically surprising enough to give me such embarrassment I was feeling. It was rather honest and peaceful to the extent that one might think it was a bit too simple. Yet it had the strange power that attracted my eyes. I proceeded to the next page. There was a traditional-styled roof covered with white snow. Above the roof, there was the sun, which was hard to tell whether it was rising or going down. I watched it for a while, and read the next page. In his photos and essays, there were sincerity and honesty that I came across after a long time. The photo was telling plain stories, without pretension, to me. The essay was covering the story that the photo was telling us. It was this specific character that was strangely attracting my heart. I know that this place is a board for writing reviews and I know that I should introduce more about this book, but I feel I am not eligible for reviewing this book. However, I do have words to tell people who watch a 'person' named Bae Yong Joon through glasses thickly covered with arrogance, just like I did two days ago. 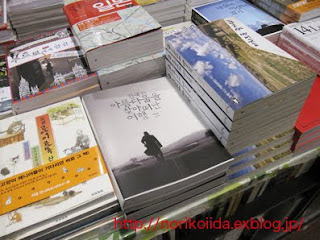 Right now, do pick up 'the book of BYJ' and start a journey in search for the beauty of Korea. At the end of that journey, you will find a friend, who has the same beauty with that country, standing by you. Photo credit : as labeled, BYJGallery/Style.